Here we feature just a sample of the numerous custom solutions we've put together for some of our diverse clients. Whether you need a creative way to move the Liberty Bell or find a way to reduce shock in outer space, Sorbothane® is the material for you. It's the trusted choice of engineers worldwide for developing materials and components that isolate vibration, attenuate shock and damp unwanted noise. Product Idea: A material innovation that provides Sorbothane shock and vibration protection in any wet environment application. Inspiration: Independent design engineers asked for a solution when faced with the challenge of protecting machinery life and performance in consistently wet conditions. 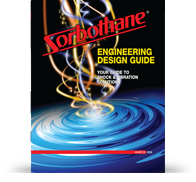 Sorbothane® Solution: The Sorbothane Engineering Team developed Water-Resistant Sorbothane®, which is a material that is resistant to water while still maintaining its ability to decrease shock and control vibration. 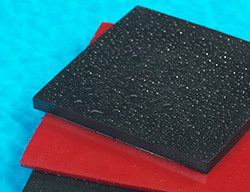 Water-Resistant Sorbothane® absorbs shock in damp situations, provides vibration control in wet conditions, and is not a temporary coating or film covering. Challenge: Protect battery system's integrity during launch, deployment and space travel. 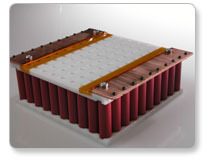 Sorbothane® Solution: Developed custom Sorbothane® components that work within a structured framework to fully protect the functionality of the intricate battery system. The Sorbothane® components perform in limited space to attenuate shock and isolate the battery system from harmful vibrations. The engineers at Quallion chose Sorbothane® for its remarkable, near-faultless memory and extremely long performance life. 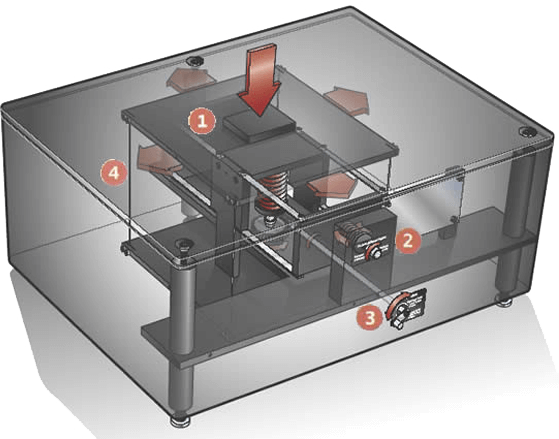 Challenge: Develop a tilt-motion isolator pad to complete the three isolator-stacked technology. Sorbothane® Solution: Partnered with Minus K® to test and refine the proper size and durometer of Sorbothane® to be used in the creation of a tilt-motion isolator. The unique visco-elastic properties and memory of Sorbothane® made it the ideal material to complete the Minus K® three isolators system. Minus K® technology reduces outside vibrations enabling sensitive equipment and instruments to perform at optimum levels. Challenge: Protect the 7" TFT LCD touchpad screen from rigorous use in the most extreme conditions. Sorbothane® Solution: We integrated Sorbothane® corner mounts into the lightweight, polycarbonate, plastic alloy case to fully isolate and protect a hybrid touchpad screen. 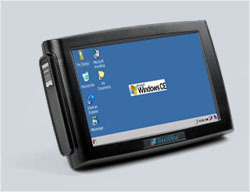 The TouchPC Hawk features a tough, rugged design, and can be used in vehicle-mounted or portable situations. Engineers needed a dependable material to shield the TFT LCD screen from the shock and vibration of off-road travel. Sorbothane® ensures the screen's functionality and integrity as it conveys clear driver-downloaded information and uploaded input. Challenge: Absorb the impact of a baseball without compromising flexibility or causing rebound. 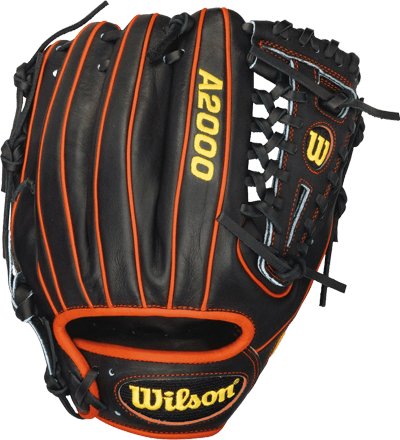 Sorbothane® Solution: A unique Sorbothane® pad was engineered and strategically located within each of the specially selected Wilson® gloves. The Sorbothane® pad works to absorb the sting of the ball without rebound. 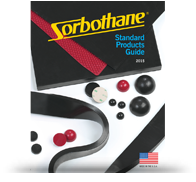 The Sorbothane® pad also maintains stability and flexibility over a broad temperature range, enabling the pad to absorb damaging impact shock in all climate conditions. Sorbothane’s faultless memory and durability ensure comfort and protection catch after catch. Its behavior mimics that of human flesh by deflecting on impact with full recovery to absorb the new blow. Challenge: Create the quietest commercial blender available for front-of-house applications. Sorbothane® Solution: Vitamix® partnered with us to create "The Quiet One," a powerful, premium blender that provides unparalleled sound reduction. Utilizing three exclusive Sorbothane® components, "The Quiet One" is definitely on a different level than its competition in terms of noise reduction. An innovative door-seal design coupled with patent-pending floating technology significantly reduced vibration transmission and improves airflow. This combination dramatically reduced the amount of sound produced during blending while maintaining the drink quality users expected from Vitamix®. Thanks to its dramatic sound reduction capabilities, "The Quiet One" fits perfectly into front-of-house operations in high-end bars and coffee houses. Designed to create a more enjoyable customer environment, our Sorbothane® solution certainly achieves that as "The Quiet One" operates at 18 decibels below its closest competitor. 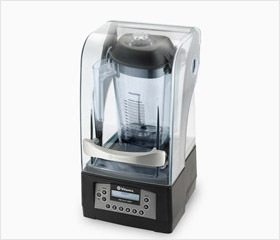 According to independent testing, this blender would be perceived as being four times quieter. Challenge: Protect irreplaceable artifacts during storage and shipping. Sorbothane® Solution: Conservators at the J. Paul Getty Museum work diligently to perfect the safe storage and shipping of precious art and artifacts. The unparalleled shock absorbing and vibration isolating properties of Sorbothane® made it the ideal choice for logistics professionals at the museum. 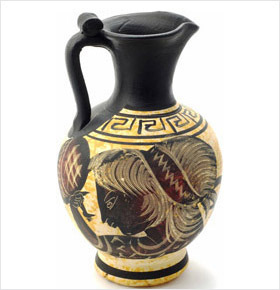 As Sorbothane® sheets and components can be configured in precise custom alignments, the material was the perfect choice to protect unique and intricate art, pottery and artifacts. Hamrick Manufacturing & Service, Inc. Challenge: Protect product as it arrives at end-of-line for packaging and shipment. Sorbothane® Solution: Our team devised a Sorbothane® "bumper" system to protect the product as it arrives and is prepared and packaged at the end-of-line station. 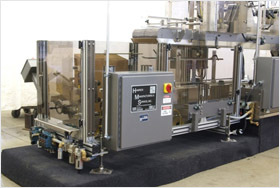 Hamrick packaging machinery is built to stand the test of time, so our bumpers needed to accept systematic, repeated compressions and perform without failing. Sorbothane® can attenuate up to 94.7 percent of impact shock and recover fully for the next blow, which made it the ideal material for Hamrick's needs. 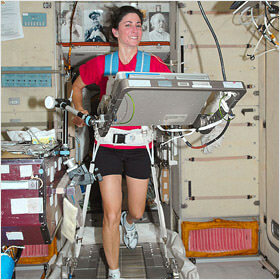 Challenge: Isolate the harmful vibrations transmitted through the treadmill to the international space station itself. Sorbothane® Solution: We developed a vibration isolation system to keep impact forces generated when running on a treadmill from shaking the entire space station. NASA's treadmill design team partnered with our engineers to produce a unique Sorbothane® component that successfully works to attenuate the impact shock of running on the treadmill while isolating the treadmill's vibration from affecting the space station itself. 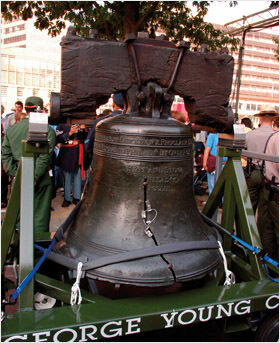 Product: Liberty Bell Wheeled Carriage Support System. Challenge: Move the Liberty Bell 935 feet to The Philadelphia Museum of Art without causing any further expansion of the historic crack. Sorbothane® Solution: A tremendous amount of care was needed when attempting to move this national treasure, and Sorbothane® was more than up to the challenge. A specially-designed wheeled carriage outfitted with Sorbothane® isolation mounts supported the bell and prevented the transfer of harmful shock and hazardous vibration energy. Designed in accordance with classic shock and vibration principles, the final result was a composite structure of steel and Sorbothane®. Steel plates provided the "column strength" and maintained the correct shape factor while alternating layers of Sorbothane® isolated the bell from harmonic vibrations. In addition, dynamic deflection of the isolator assembly prevented shock energy transfer. 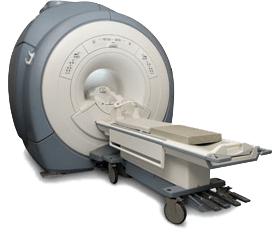 Challenge: Transport high-definition GE MRI units without damage. Sorbothane® Solution: The professionals at GE Healthcare needed to ensure the safe and effective delivery of their high-definition magnetic resonance machines, and chose to partner with us after seeking out an experienced company specializing in shock and vibration damping. We conducted a thorough transportation study, and developed a proprietary crating, loading and shipping system as a result. Strategically-placed Sorbothane® Shock & Vibration absorbing elements were integrated into the entire process, and works to protect intricate computer systems and safeguard the delivery of GE MRIs anywhere on the globe. Challenge: Protect the integrity of space shuttle cameras during extreme launch conditions. 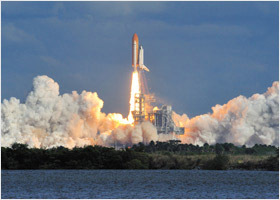 Sorbothane® Solution: Our engineers supplied the NASA design team with a unique Sorbothane® isolator designed to protect shuttle cameras from the violent vibrations thrust upon them during launch. The Sorbothane® component attenuates vibration damage to the highly-sensitive cameras, which provide NASA with vital information used to verify the integrity of the shuttle's heat shields. Challenge: Deliver consistent, uniform and reproducible action and test results. 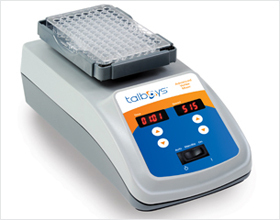 Sorbothane® Solution: Troemner designs, engineers and produces world-recognized lab equipment. When their engineers needed a superior elastomeric for their Vortex Mixers, they turned to us. We designed specific Sorbothane® components for use in the full range of heavy-duty Vortex mixers. Sorbothane® parts are now an integral component in the exacting, repeatable motion of Troemner's Vortex mixers. Not only does Sorbothane® allow for continues operation of the mixer, it helps deliver fully-dependable test results.